Dine in the 1909 neoclassical Cliff House where years of history have been brought back to life with the restoration completed in 2004. 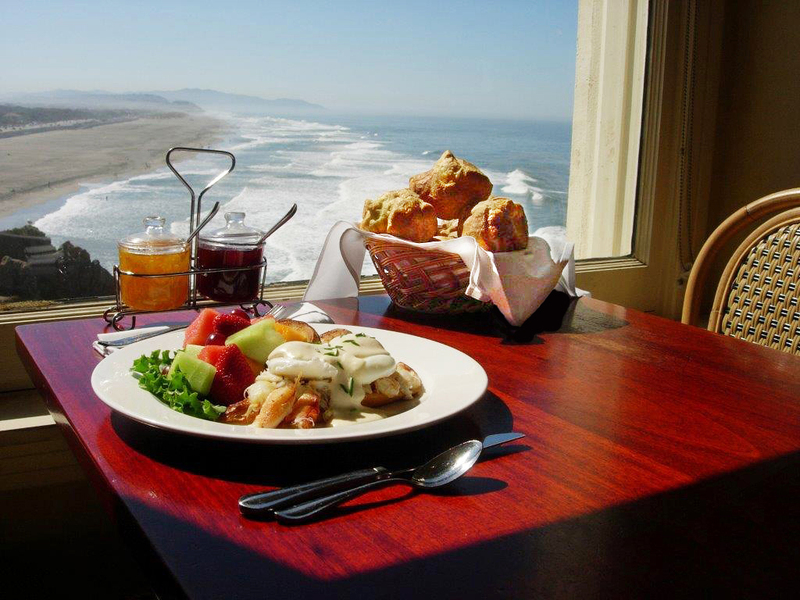 Magnificent views of Ocean Beach and Seal Rocks add to the historic ambiance, and if luck is with you, there will be some whales frolicking in the water right below your table. These gentle giants migrate north from Baja for the summer and the show is always impressive. The Bistro Restaurant offers a casual dining experience featuring a classic San Francisco menu for breakfast, lunch, and dinner. In keeping with its casual atmosphere, The Bistro is seated on a walk-in only basis and does not accept reservations. On busy weekends if there is a bit of a wait, you can enjoy our award winning Bloody Marys or refreshing Ramos Fizz in one of the lounges. 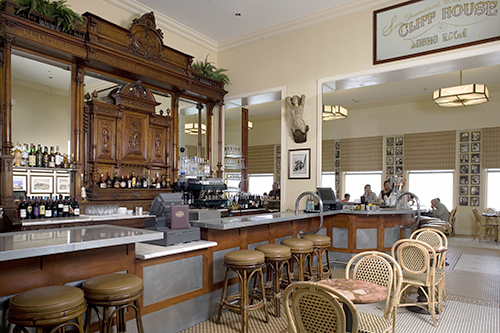 Named for the metal that covers it, the Zinc Bar adds to the history and allure of the 1909 building that houses it. Using zinc for bar and table tops became popular in France in the early 1900s because of its availability and cost effectiveness. The hand-carved back bar was built in 1889 for the Parisian World’s Fair of 1890. And here’s a tip from the locals – avoid the wait for a table in The Bistro and enjoy the full menu at the Zinc Bar. Our Balcony Lounge overlooks the Sutro’s restaurant from the main level and is a fun place to catch a beautiful sunset or get cozy by the fire on a cool evening. Here too the views are amazing, with live jazz offered every Friday night from 7:00 pm to 11:00 pm. To find out which groups are scheduled for the upcoming weeks click here. Please note that items and pricing are subject to change. Click here to view our kid’s menu. Large party reservations of 17-49 require a preset menu, a $250 deposit, and a contract. To see prix fixe breakfast, lunch, and dinner menus, please use this link Large Party Packet 2018.
for The Bistro on Friday, Saturday, or Sunday. Please use the LARGE PARTY REQUEST FORM button below for inquiries. We try to respond within one day for requests. If requests are placed during a holiday, the response time may be longer. Our cancellation policy allows you to cancel 72 hours prior to the reservation. We ask for your credit card information in case you do not let us know that you cannot make it. Unfortunately, if we end up with an empty table after having turned business away to be ready for you, we will charge $25.00 per empty seat. To find large party information for Sutro’s click here.